Free Music Friday! Fleming - "Slip"
It’s not often that you find a band comfortable and confident enough in what they do well—in this case, NYC-based three-piece Fleming and their catchy alt-rock and pop—to name themselves after their drummer. Honestly, it just doesn’t happen. But then again, you don’t often meet a guitarist and a bassist who are also surgeons. Talk about docs who rock. And when Erich (guitar, vocals) and Guillem (bass, vocals), who had been playing together in coffee shops and talent shows since their early days at Columbia University, met Andrew Fleming, their sound took on a whole new dimension—as did everything else. Case in point, Fleming (the man and the band) are celebrating the release of their debut EP, Play for Manuel, at the famed L.E.S. staple that has become their stomping ground of late, the Mercury Lounge. 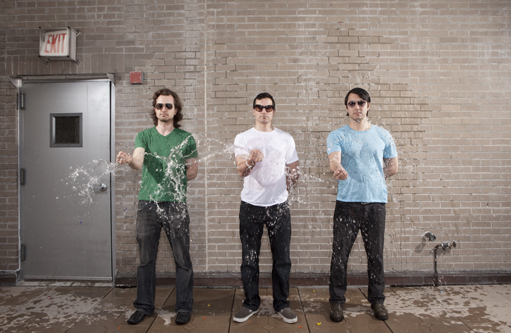 After making their debut performance in 2003 at the now defunct ACME Underground, Fleming have since turned heads and enticed a loyal following with crowd-pleasing shows at venues including Bowery Ballroom, Don Hills, the Continental, Luna Lounge, and Knitting Factory. In fact, it is through the strength of their patented high-octane performances that Fleming earned themselves a coveted residency at the Mercury Lounge. With a sound that has drawn comparisons to Red Hot Chili Peppers, Interpol, and Matthew Sweet, they have a penchant for energetic backbeats courtesy of Andrew Fleming’s deft drum attack, while maintaining a certain dark introspection. Listen closely and you’ll hear musical forebears like the Cars and the Police.